I'm taking a cue from Gina @ Vintage Junk in My Trunk and utilizing my month off from classes to attempt to list EVERY. SINGLE. holiday item I have stockpiled over the last year (or more - in some cases). She has been listing an item a day on Etsy for over a year a half now. Now, that takes a lot of dedication. 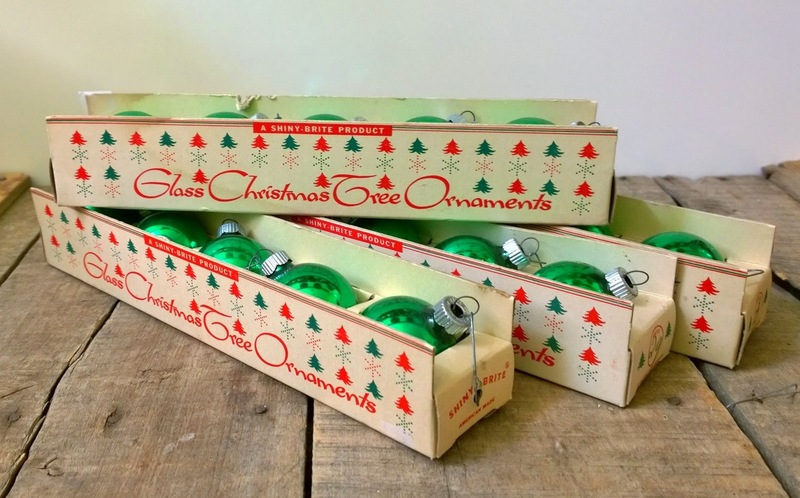 I'm just going to list as many holiday items as I can for about a month (July 30 - August 31) in my holiday Etsy shop: Melissa's Retro Christmas. 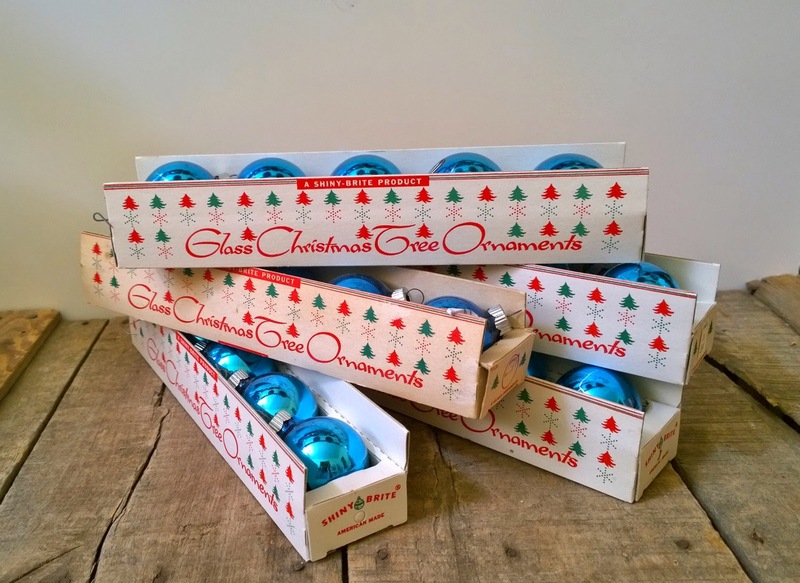 I sell other holiday items besides Christmas, but that's the majority of what I sell. 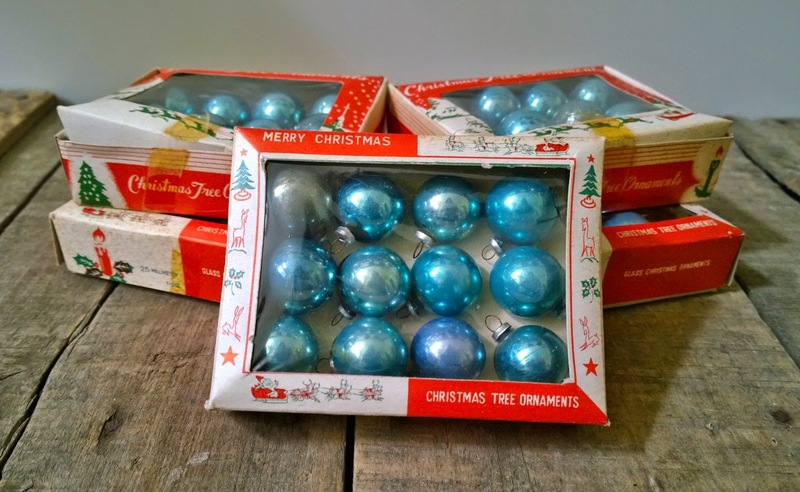 So far I've listed 9 Christmas items (on July 30) and 10 Halloween items (on July 31). You can now own 1 up to 5 boxes (that's 25 total!) of bright blue Shiny Brites! Someone really loved blue because I bought these in the same lot as the ones above. Or are you more of a green person? Straight out of 1969. 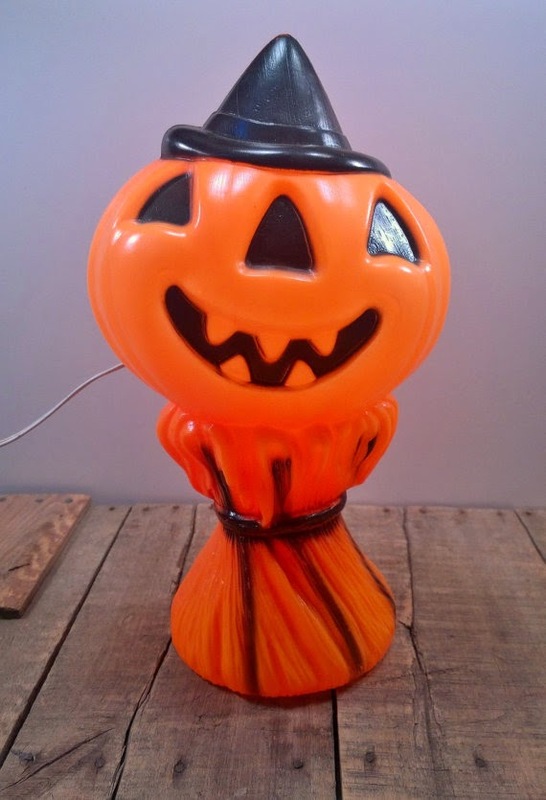 The perfect addition to your Halloween decor! Possibly one of the coolest items I've ever had the chance to buy. 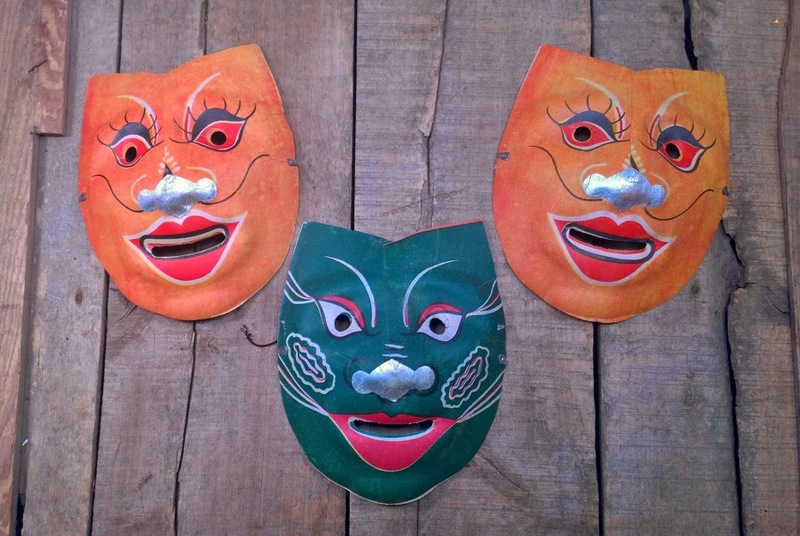 These 3 Halloween masks are marked Occupied Japan. That means they date from sometime between 1945-1952. 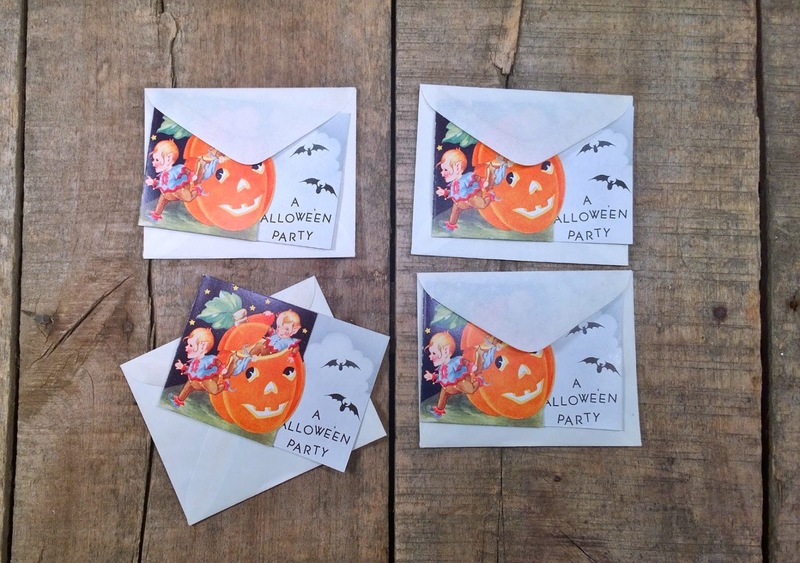 These 4 sweet Halloween party invitations are in mint unused condition. They would look adorable framed with a black or orange mat behind them. In other news: please go link up any of your wedding related blog posts. It doesn't matter how long ago you wrote it - I wanna see it all. Show me your vintage cake toppers, mason jar lanterns, wedding tablescapes, upcycled cake stands, seriously ANYTHING that could be wedding related. I want to get my creative juices flowing for my wedding. I have ideas brewing, but I need your help too! I haven't even thought about listing holiday! YIKES! You are doing much better than I am! Too distracted by all the stuff still at the yard sales and flea markets, and our big New York adventure is a week away. One listing a day is not nearly enough to get through the hoard of Shiny Brites and knee huggers, but I'm trying! Good luck with yours.